A team of researchers at University of Pennsylvania School of Medicine led by Xianxin Hua, MD, PhD, have gained detailed understanding of how mixed-lineage leukemia (MLL) fuels itself to continually cause blood cells to grow out of control. The information, which the researchers published in he current (Feb 2010) issue of Cancer Cell, is imperative in the researchers pursuit to find an effective treatment for MLL patients in the near future. “This research not only uncovers the crucial role of a normal protein key to the development of MLL, but also how the cancer cells stay alive in the first place,” says Hua. MLL is an aggressive childhood cancer that occurs when a piece of chromosome 11 breaks off and attaches to a different chromosome, resulting in uncontrollable blood cell growth. Children diagnosed with MLL poorly respond to common leukemia treatments, leaving little hope for these children. When the piece from chromosome 11 attaches to a different chromosome, a protein is produced that leads to the uncontrollable blood cell growth that makes the children so ill. The researchers call this protein the “fusion protein.” The researchers deleted the gene for the normal protein from leukemia cells and the uncontrollable growth of cells did not occur, which led them to their conclusion that this normal protein was necessary for MLL to thrive. 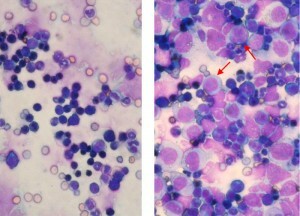 Knockdown of normal MLL gene in human leukemia cells reduces leukemic infiltration in mouse bone marrow (left), compared with heavy leukemic infiltration in marrow from leukemia cells with normal MLL gene (right). Arrows denote leukemic cells. Another crucial conclusion for their research is that the normal MLL protein and the “fusion proteins” interact due to chemical modifications on chromosomes. These modifications allow a change to occur that increases the number of leukemia cells that survive over time and keeps a sufficient amount of leukemia stem cells present. As Hua’s team of researchers continues to gain understanding of MLL they will hopefully find a better treatment for the patients afflicted with the disease. Being diagnosed with a disease with such little hope for treatment and control is perhaps one of the most disheartening things that can happen to a child. Hua’s team is on the right track to finding the treatment needed to give hope to children with MLL. The translocation of part of chromosome 11 sounds a lot like one cause of CML, the Philadelphia Chromosome (reciprocal translocation of parts of chromosomes 9 and 22). Interesting that translocation of different chromosomes are one of the causes of different types of myeloid leukemias. My Friend forwarded your Post on Thursday.Your post was Well written.Pl. keep posting on body parts. Thanks a lot to this info. This most needed for the new users of windows 10 computer system and they can learn here how to work with command prompt. Next Next post: The Sea Squirt: An Answer to Alzheimer’s?